Some things repeat themselves, and not by accident. Everyone reading this knows that Lee Harvey Oswald was arrested as the patsy that was set up in the assassination of President Kennedy. 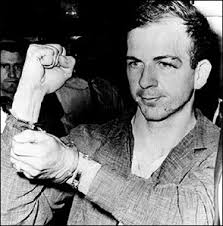 Oswald of course, was shot by mob associate Jack Ruby while in police custody, thus closing the case with the designated assassin never to tell the true tale of the plot. Next, we have an indecent in May of 1979 where suspects were arrested in a possible plot to kill President Carter, and who pops up? “LOS ANGELES, May 11 (UPI) — Investigators have found evidence, including a gun case, ammunition and corroborative testimony, that adds credibility to a reported plot to assassinate President Carter, originally dismissed as a tale spun by an intoxicated man. Agents of the Federal Bureau of Investigation said today that they had found support for he story told by Raymond Lee Harvey, who was arrested by the Secret Service when he was found carrying a starter pistol near the President. Mr. Harvey, 35 years old, contended that he was supposed to have fired the harmless starter pistol into the ground at an appearance by Mr. Carter in Los Angeles last weekend, creating a “diversion” for the real assassins to shoot the President. After his arrest about 50 feet from where Mr. Carter was speaking Saturday, Mr. Harvey told Secret Service agents that he was part of a four‐man plot to kill Mr. Carter. Mr. Espinoza‐Ortiz also agreed with Mr. Harvey that they knew two Mexicans at the hotel who had rifles. Mr. Harvey told agents that he had been told of the plot by the three others in a room at the hotel and that he understood they would fire the fatal shots when he created the distraction with the starter pistol, which could fire only blanks. “De la Mata identified citizens of Mexico, the United States and South Korea as the main suspects being investigated on charges that include of causing injuries, making threats and burglary. He named Adrian Hong Chang, a Mexican citizen living in the United States, as the break-in’s leader. These things don’t happen by accident. Much like the “coincidence” of assassins John Hinckley and Mark David Chapman both reading “Catcher In The Rye”, the name “Oswaldo” keeps popping up in intelligence operations. Apparently there is a sense of humor along with continuity in these dark intelligence operations. This entry was posted on March 28, 2019 at 3:21 pm and is filed under Kennedy assassination. You can follow any responses to this entry through the RSS 2.0 feed.